Twelve of the UK's top cartoonists from The Independent, Private Eye, Professional Cartoonists Organisation and The Sun cross pencils to complete huge cartoons in a race against time. 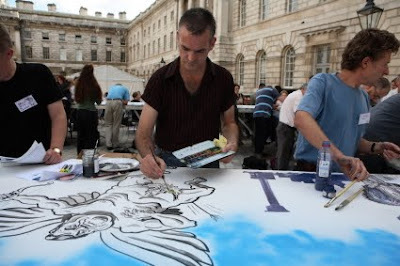 The annual Campaign for Drawing 'draw-off' takes place this year outside Idea Generation Gallery with live commentary from Andrew Marr, TV film crews and FREE WORKSHOPS for all ages. Visitors will also be treated to live drawing and instruction from Id-iom (Sholto and Hugo Brown) who will bring the ultimate in urban street art to Shoreditch including spectacular graffiti, interactive labelling and a few tricks certain to please the crowds. Children always love the excitement of the event and will be inspired to join in the fun as we get everyone drawing. The Battle of the Cartoonists is a completely free event, everyone is welcome and there is the added bonus of free Magners to keep the adults entertained. The Battle is taking place outside Idea Generation Gallery, located on Chance Street in the heart of Shoreditch (10min walk from both Old St and Liverpool St stations). Throughout the Battle Idea Generation Gallery will open to the public and will be showing Now We Are Ten – a huge selection of donated works from both well established and aspiring illustrators including Quentin Blake, Paula Rego, Lord Foster, David Mach and Kiki Smith. Today Saturday 12th September, 2 – 5pm.